Like most houses, we have that weird area in between our house and the neighbor’s house. Not big enough to make a dog run,…..humanely, or even a place to keep chickens…….yet. 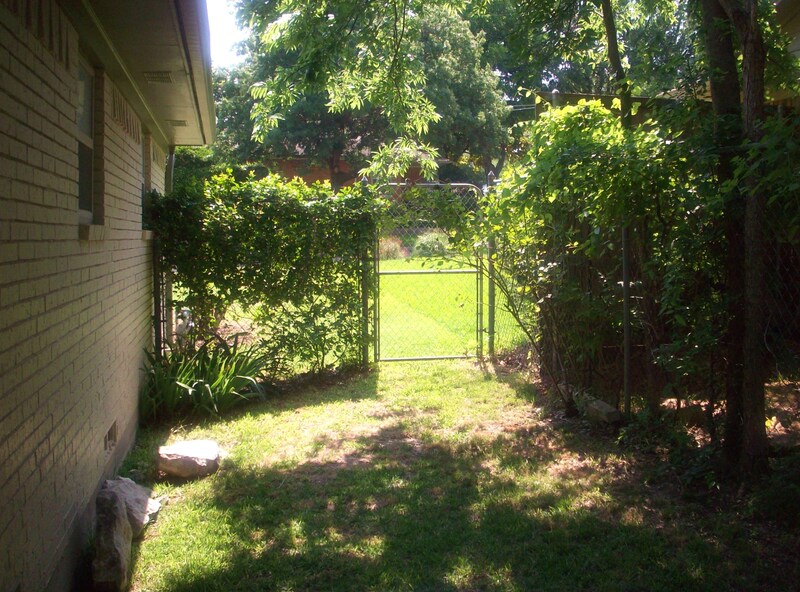 It’s a nothing space, but necessary if we need to access the back yard from the front yard. This is where the gate is. When we moved in there was chain link, honeysuckle, irises, and a few big rocks. After the chain link and honeysuckle were removed, and we trimmed the trees up a little, we really got a view of just how little space we were dealing with. I can’t believe there was ever that much grass growing over there. 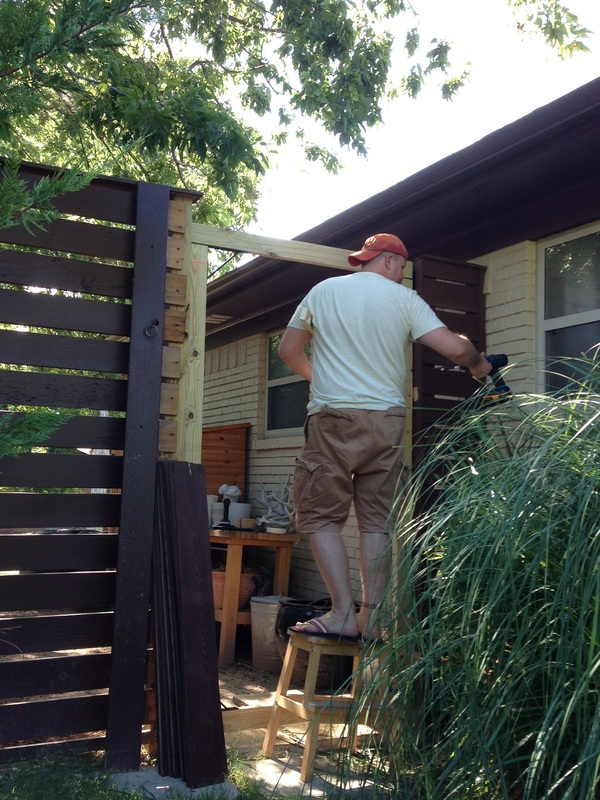 This was the first part of the fence that Jack built….Good God, Over 3 years ago! 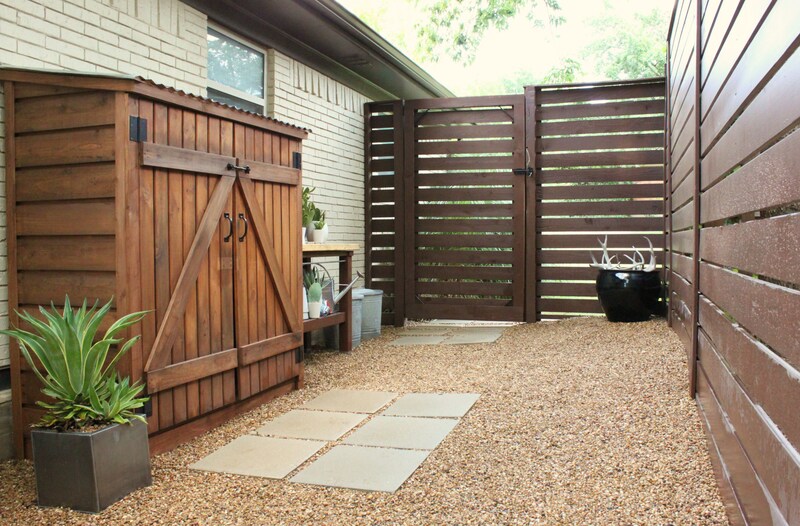 The horizontal fence created that perfectly odd little “prison yard” space on the side. This picture must be from 2 years go, you can see that the gate is still the old short one. We’ve obviously only stained the front part of the fence too. The whole right side is still the color of dry cedar. You can also see the trail that Harley carved by runing to the front to bark at people who dare to walk in front of our house. When it rains, it’s all mud. 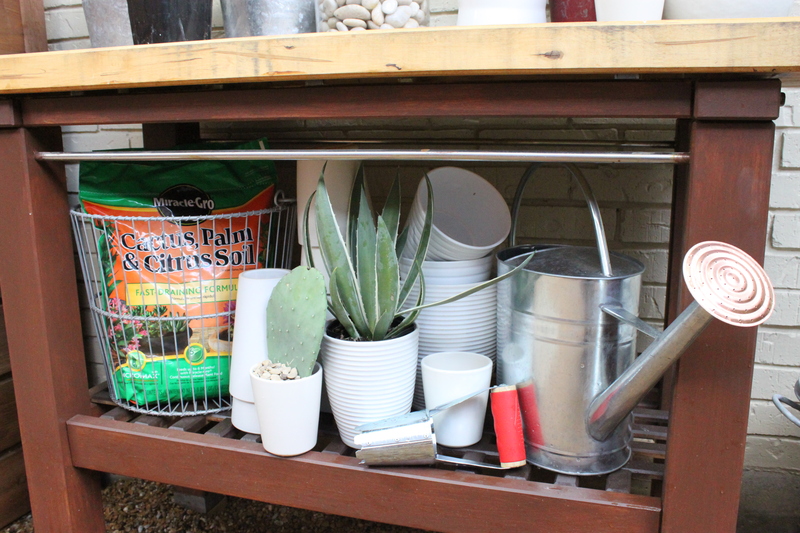 We suppose this is just enough room for a potting bench….like the one below from Ikea. It’s really a kitchen island, but has held up pretty well outside under the eave. Jamie wanted to add a tool shed too. We replaced the back gate to the driveway a few weeks ago….. 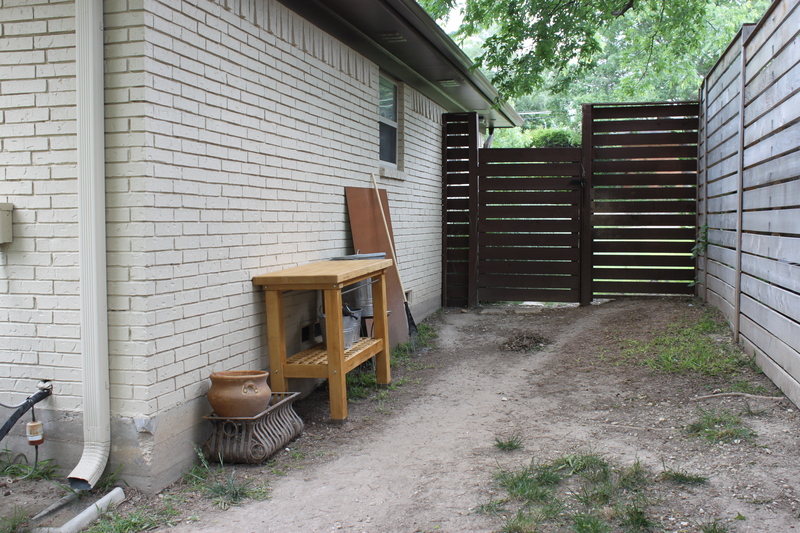 The front gate was even more disproportionate to the fence…….Look how short it is here. This transformation was much faster than the other gate. We are experts at building gates by now. 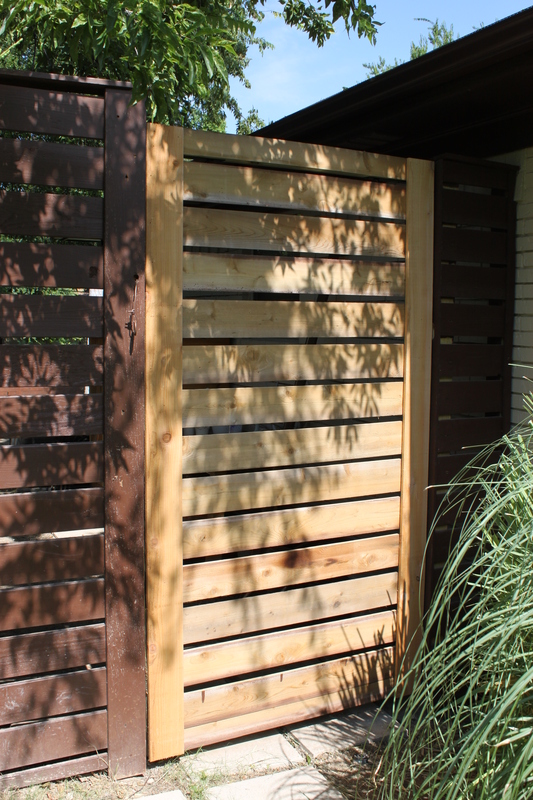 I reused the same boards, only flipped over to the unstained side, but we quickly discovered that they were 1/2 inch wider than the fence slats. Light years better than what was there before. Looks even nicer with a coat of russet stain. Way , More, Much Better….. But the crowning finish was 15, 30, 45 bags of pea gravel from Home Depot. We had toyed with the idea of having a small truckload delivered. But for some unknown reason we thought it would be much easier to just “pick up a few bags”. 3 trips later, we had “picked up” 45 bags, about 4 times each. 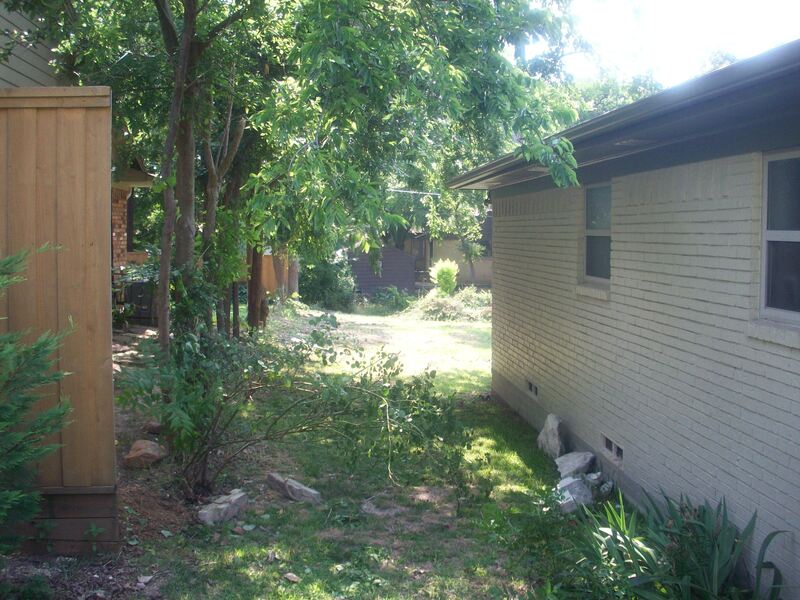 Here’s a reminder of what the side of the house used to look like. And here’s what it looks like today……. Quite a bit better, we agree. I “restyled” Jamie’s mail-order tool shed, but more on that to come. From the front yard through the new gate, we walk right into the potting bench. 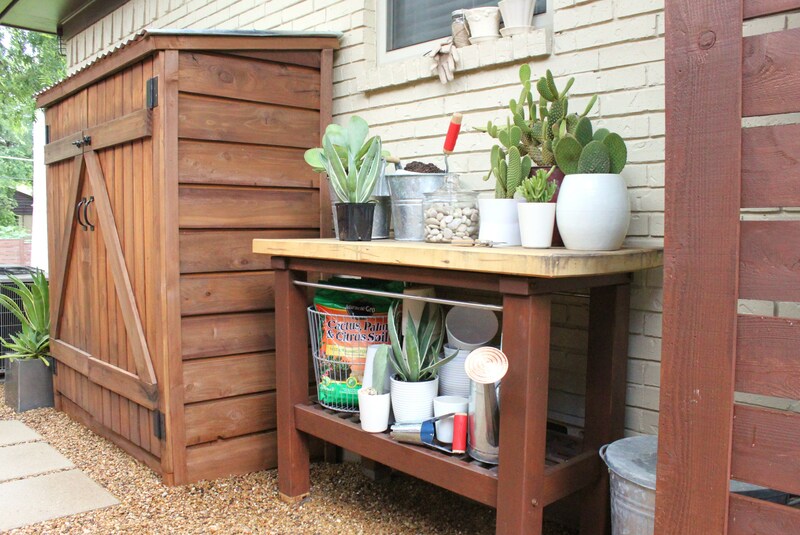 I stained the bottom half with the same “Russet” stain from the fence and filled it with all the crap we need to pot plants….well, mostly cactus. Now we have the perfect gardening area. No longer that sad, sad “space” on the side of the house. Someday….AAAhhhhh someday, the backyard will match this area in “Awesome-Ness”. This may be the change that you have impressed me the most with. Absolutely amazing. Gr8t job. Looks very clean, professional, and modern. Wish I could hire you to do something similar. What’s under the pea gravel? Gotta say: that is an INCREDIBLE transformation! You two are amazing!!! Love it!! Very nice Gentlemen…. but then everything you do is!! It’s absolutely wonderful – I love your blog and sharing these projects with you! Thanks Buffi, we’re glad that you’re here reading along with our mayhem…. You guys never cease to amaze me, fabulous job! It’s just what I need on the side of my house. Thank you. fanTAStic work! i decided to do gravel as well. your work inspires me because the side of my house that i want to work on first is quite similar. since i’m on a limited budget, i will have to take the long route, too. how deep did you go before placing the weed blocker and how deep did 46 bags of pea gravel fill? and thanks for posting! Hi Karen , glad you found us. We did about 2-3 inches of gravel. Because the yard slopes towards the house, it’s thicker in that area. 46 bags went pretty far, enough for our dog to spray gravel every time she runs through! Love the shed. Can you share where it came from? I want to put a shed just like that at the back of my house but am concerned about possible moisture build up or dirt and debris collecting behind the shed. I also have a brick ranch. Did you have any thoughts about that? Also did you fasten it to the brick or is it free-standing? Hi Julie, we left a small space between the house and the shed, just a few inches, no problems yet. However, we built up the height with bricks…so there’s a small space underneath….and “something” lives under there…I’ve never seen evidence of any animal (rat, snake, don’t know what else would fit…) but the Doberman wants under there reall bad, so I know. Hey James. This is looks awesome. 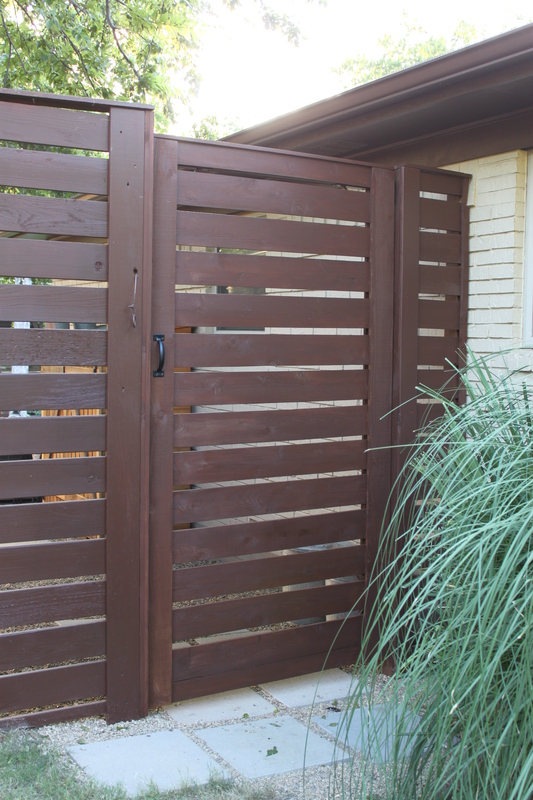 I’m building a horizontal fence and I love your design. 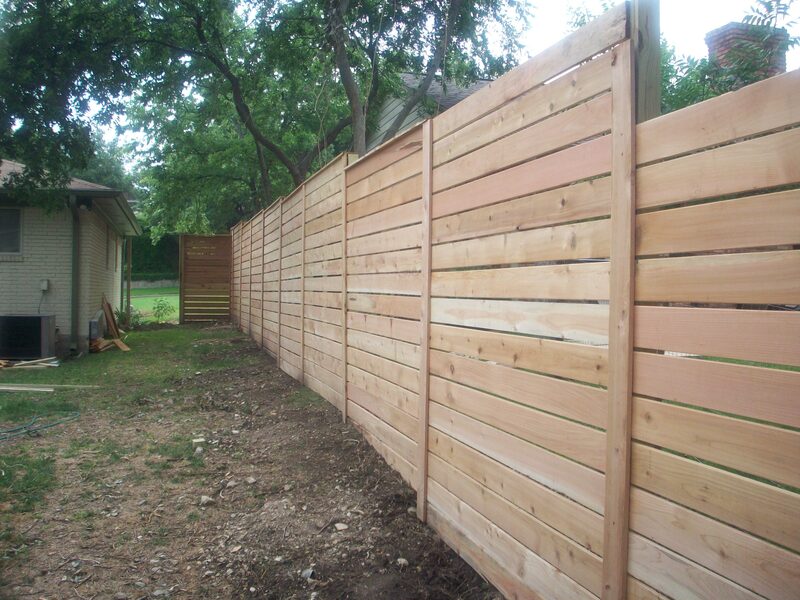 I know you did 1/2″ spacing with your slats for the fence. Did you do the same spacing for the gate? It looks more like 1″. 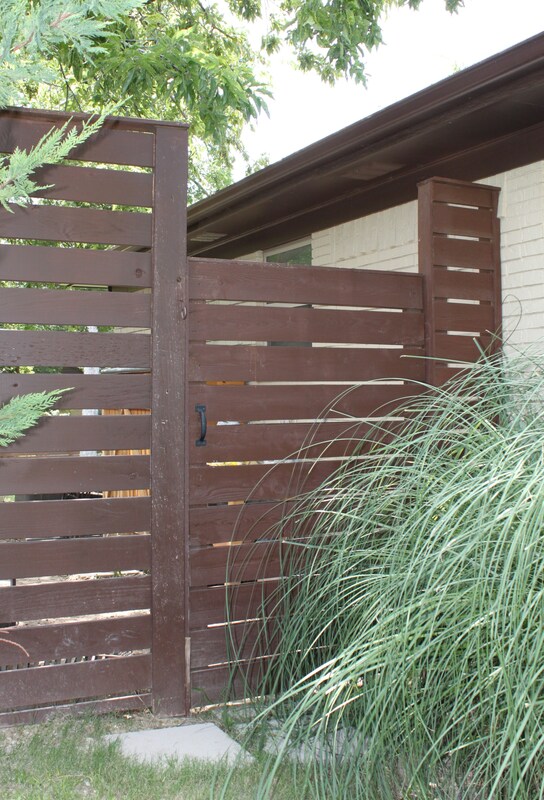 Also are the slats for the gate 1×6 like the fence slats? Thanks bud!